Introducing Blaine, ATC’s “Arco Chief”, otherwise known as Arco’s Plant Supervisor. Blaine has been taking care of the Arco, Mackay, Moore, and Howe areas since 2000. When Blaine is not busy traveling to his kids’ sporting events, he can be found camping and boating with them at nearby lakes. Blaine enjoys any home-cooked meal – as long as it’s made with real butter and served with salad and Pepsi. Having come from a large family, Blaine has deep roots in the Lost River Valley, and is honored to live and work amongst friends. 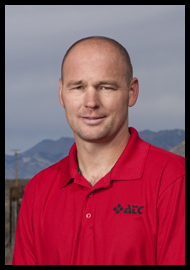 We’re thankful to have Blaine overseeing our Arco area!